Nordic Winter, by The Weed Patch. 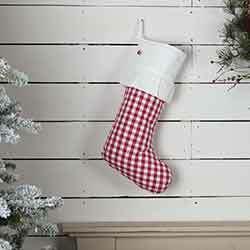 Striking red and white palette, with a hint toward the Scandinavian. 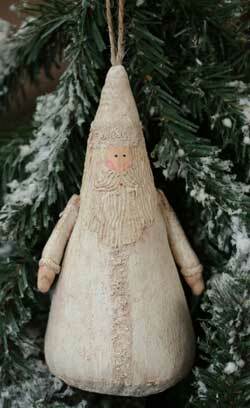 Wool, gnomes, bare, simple wood, stars, hearts, a little quirky, a little Nordic. 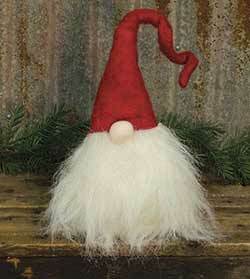 This darling gnome plush doll is sure to bring a smile to family and friends, with his oversized hat, long beard, and just a big nose peeking out. Brown & White Santa, by Raz. 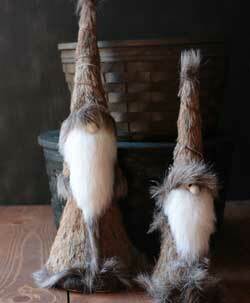 Sold individually - Choose the Taller or Shorter santa. 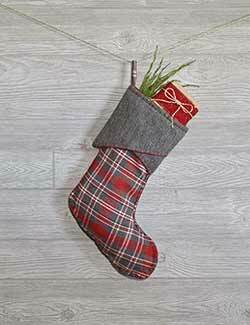 Part of the Owl Be Home For Christmas Collection. Shorter is 12 x 5.5 x 4 inches, Taller is 16 x 6.5 x 6 inches. 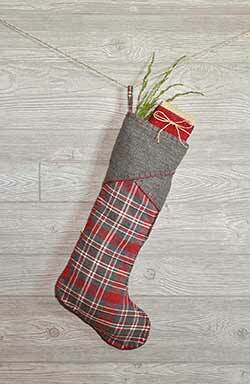 Made of faux fir, sisal, and foam. 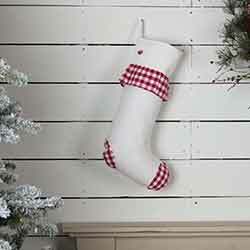 Canvas Cone Santa Ornament , by Dekorasyon Gifts. Measures approx 6 inches. 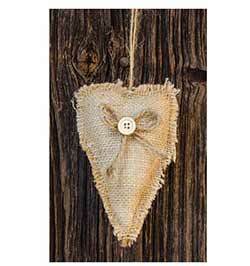 Made of hand painted canvas, antiqued, with a sanded base so you can stand as a figure too! Chalet Bowls, by Tag. Wax resist stoneware. Gray has matte glazed finish, and 3 capacity; Red has shiny glazed finish and 1.5 capacity. Part of the Chalet Collection. Red measures 3.25 x 4.5 inches, Gray measures 3.25 x 6 inches. Chalet Diamond Dishtowel, by Tag. 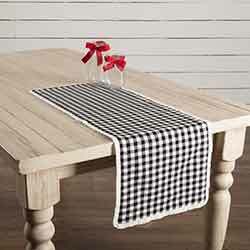 Beautiful cotton dishtowel in a diamond pattern with a burgundy, cream, and white color palette. Sold individually from the two in photo - Choose the printed towel, or the red waffle weave towel with the printed border. Part of the Chalet Collection. Measures 18 x 26 inches. 100% cotton, machine washable. 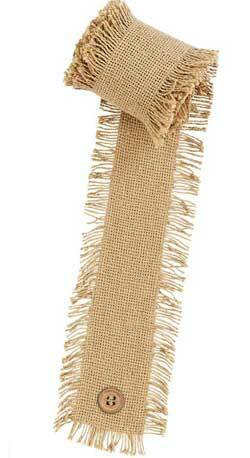 Chalet Embroidered Waffle Weave Dishtowel, by Tag. 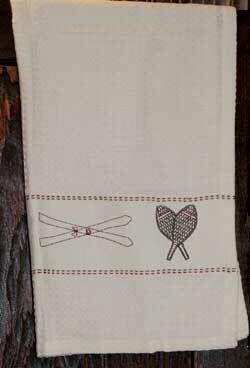 Off-white waffle weave dishtowel with embroidered winter designs (skis, snow shoes, etc). Part of the Chalet Collection. Measures 18 x 26 inches. 100% cotton, machine washable. Chalet Plate and Mug Set, by Tag. Reads: Eat, drink and be merry! Wax resist stoneware and shiny glazed finish. Part of the Chalet Collection. Plate measures 8.125 x 5.375 inches, Mug measures 3.75 x 3.25 inches (10 ounce capacity). Chalet Snowflake Lidded Beverage Server, by Tag. Perfect for coffee, tea or hot chocolate; wax resist stoneware and shiny glazed finish; hand wash. Part of the Chalet Collection. Measures 7.125 x 4.5 inches. 5.5 cup capacity. Bring your country picnic indoors this winter with the Emmie Black 36 inch Runner. Our on-trend yet classically styled look is flourished with gathered ruffles to add a holiday spin to this farmhouse hit. 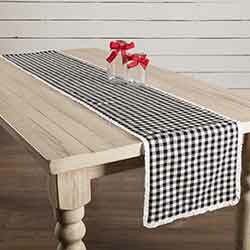 Bring your country picnic indoors this winter with the Emmie Black 72 inch Runner. Our on-trend yet classically styled look is flourished with gathered ruffles to add a holiday spin to this farmhouse hit. 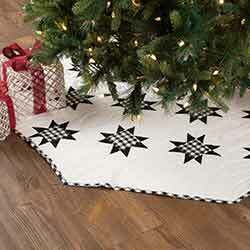 Countrify your Christmas this year with the Emmie Black Patchwork 48 inch Tree Skirt. A holiday significant 7 rows of 8-point stars are placed on a bright white background. 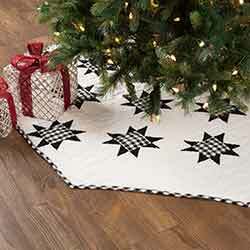 Countrify your Christmas this year with the Emmie Black Patchwork 55 inch Tree Skirt. A holiday significant 7 rows of 8-point stars are placed on a bright white background. 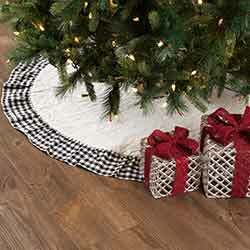 Countrify your Christmas this year with the Emmie Black Patchwork 60 inch Tree Skirt. A holiday significant 7 rows of 8-point stars are placed on a bright white background. 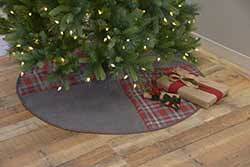 Countrify your Christmas this year with the Emmie Black Patchwork Mini 21 inch Tree Skirt. A holiday significant 7 rows of 8-point stars are placed on a bright white background. 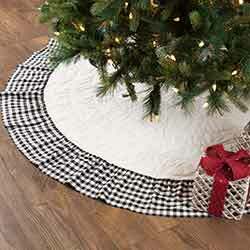 Countrify your Christmas this year with the Emmie Black Ruffled 55 inch Tree Skirt. A bright white cotton base is hand-quilted, then trimmed with black and white check ruffles. 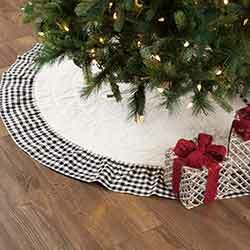 Countrify your Christmas this year with the Emmie Black Ruffled 60 inch Tree Skirt. A bright white cotton base is hand-quilted, then trimmed with black and white check ruffles. 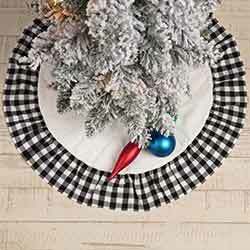 Countrify your Christmas this year with the Emmie Black Ruffled 21 inch Mini Tree Skirt. 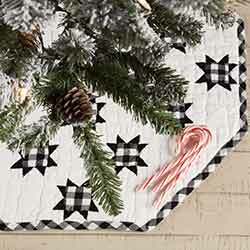 A bright white cotton base is hand-quilted, then trimmed with black and white check ruffles. 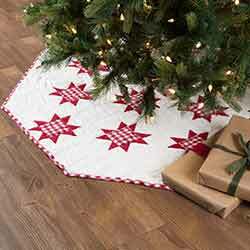 Countrify your Christmas this year with the Emmie Red Patchwork 48 inch Tree Skirt. A holiday significant 7 rows of 8-point stars are placed on a bright white background. Countrify your Christmas this year with the Emmie Red Patchwork 55 inch Tree Skirt. A holiday significant 7 rows of 8-point stars are placed on a bright white background. 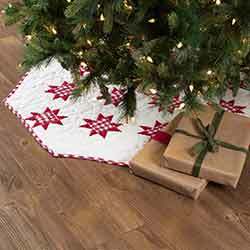 Countrify your Christmas this year with the Emmie Red Patchwork 60 inch Tree Skirt. A holiday significant 7 rows of 8-point stars are placed on a bright white background. 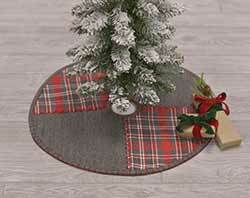 Countrify your Christmas this year with the Emmie Red Patchwork 21 inch Mini Tree Skirt. A holiday significant 7 rows of 8-point stars are placed on a bright white background. 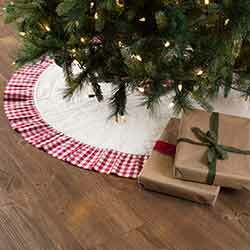 Countrify your Christmas this year with the Emmie Red Ruffled 48 inch Tree Skirt. 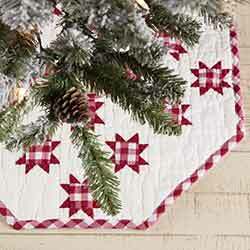 A bright white cotton base is hand-quilted, then trimmed with red and white check ruffles.